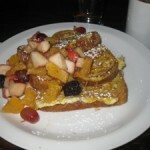 Situated on Parc Street just south of Bernard, Em Cafe is a place you would likely miss. Yet, when you step in you will see how it is more than an unassuming place and that it manages to serve up a laid back atmosphere where one can sit down and have the hours melt away. Once you step in you will notice some interesting art on the wall from a featured artist (my understanding is that it changes with time.) There is a nice long table in the middle as well as a little lounge area in the back. Next to it you, you will find a tall wooden bookshelf with newspapers and some books which can help you ease into that Sunday morning even more. 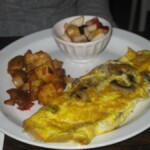 The menu is very simple and is also available on the web site. 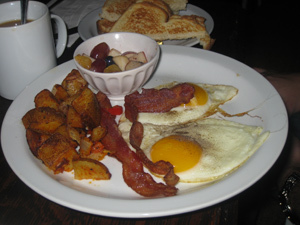 All but two plates on it are under $10 and you get free refills on the coffee as well. 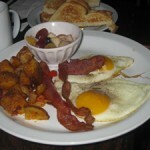 There’s 3 kinds of Eggs Benedict ranging from $7.95 to $8.95; 5 omelletes ($6.95-$8.95); (3 fruit platters $9.95-$11.95) 3 choices of either waffles, crepes or pancakes ($5.96-$6.95); there is french toast at $5.95 and it comes as either white or brown bread. 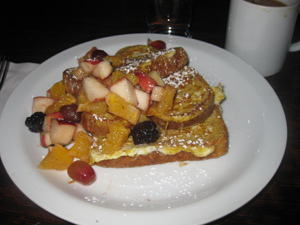 The french toast ($5.95) came loaded with fruit and the bread was a natural brown multigrain. You can taste a unique flavour in the bread they chose and this was quite enjoyable. 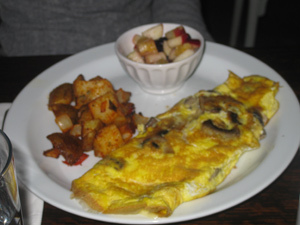 The mushroom omellette ($7.95) was loaded with mushrooms and gave the option of white cheddar or swiss. We opted for white cheddar which had a nice pronounced flavour although they only put the slice at the bottom and did not infuse it. 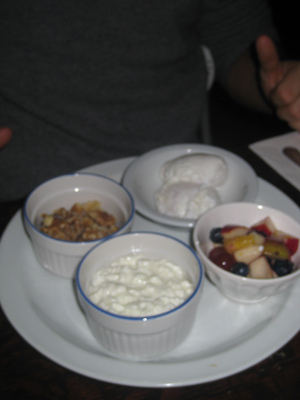 My friend had the poached eggs ($8.95) which came with a side of cottage cheese, fruit, nuts and 8 grain toast. 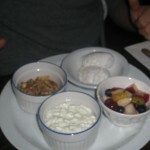 It was very healthy and you can sub the cottage cheese with yogourt. The fruit was tasty and he was was happy with his order. I was glad to see that they did have some healthy options. One issue I had with the food was that the coffee was less than awesome and tasted a touch burnt. I drank more than 1 cup to see if it was a bad batch but no luck. The service was good. They came to check on us often although the coffee refills were not as frequent as I would have liked. If you are vegetarian there are many plates which do have not meat so you do get some choice here. Also, if you are vegan, there are 3 fruit options and although i did not have the fruit plates, if they were as fresh as the fruit cup then you are in good hands. Overall, it was quite enjoyable and relaxed. The food did not stand out and the coffee was nothing to write home about, although they did some nice things with the fruit being fresh and varied and the really tasty multigrain bread. Points need to be given for the price having been under $10 as well as the laid back ambiance – in particular the art and lounge section and mini library. This is a definite “come-to-chill area” where you can come, sit down eat and not be rushed out the door for other hungry brunch go-ers.